"You're an angry man. That's good. It gives you a lot of drive." Any film that begins with music by Sigur Ros playing in the background is off to a heck of a good start. Having the guts to use relatively obscure, edgy rock bands is impressive enough, but burgeoning director Susanne Bier (Brothers) has only just begun. Her latest film, 2006's After the Wedding is one of the most engaging foreign film experiences to come along in quite some time. Apparently, the Academy of Motion Picture Arts & Sciences thought so as well, as it was one of only five nominees in their most recent Best Foreign Film Oscar category. It's also one of the last of those nominees to make it to DVD, but IFC's disc makes this well worth the wait. Jacob (Mads Mikkelsen) seems content providing aid to a group of orphans in Bombay, when he's summoned to Denmark by a prospective donator. Reluctant to go, but aware of the orphanage's financial needs, Jacob gives in, leaving his beloved "foster" children behind. He arrives in Denmark to meet the imposing figure that is J�rgen (Rolf Lassg�rd), who delays his donation and Jacob's return to Bombay so the visitor can attend his daughter's weekend wedding. Once there, Jacob meets J�rgen's wife, Helene (Sidse Babett Knudsen), who just happens to be his ex-lover from roughly 18 years ago. Little does Jacob know that the surprises don't stop there, and that a revelatory reception speech given by the bride, Anna (Stine Fisher Christensen), will change his life forever. While the above synopsis might make things sound a bit more complicated than they are, there's no doubt that Bier's film is one that sneaks up on the viewer, fully entrenching them in the story before they even realize it. At the center of things is a tour-de-force performance by Mads Mikkelsen. Known best by American audiences as the lead villain in Casino Royale, and by international audiences from the Pusher films, Mikkelsen is simply brilliant as a man who is emotionally in over his head during this seemingly lucrative trip to Denmark. His character begins as the film's focal point, but it's his ability to take a back seat to Lassg�rd during the final act that solidifies his professional acting approach. The focus shifts back to Jacob at the end, but it's this seamless focus shift that keeps things on the right track. Rolf Lassg�rd as J�rgen is a performance for the ages. To say his portrayal of J�rgen is unforgettable and Oscar-worthy is a huge understatement, and he is responsible for one of the most gut-wrenching, realistic five minutes of cinema you'll ever experience. Acting classes should be taught on this near-final sequence alone, as never has there been a more true account of what a person in J�rgen's situation is going through. This is followed by a final scene that is, in a word, perfect. When the first big shocker of a twist occurs roughly a half hour into the proceedings, I was literally sitting with my mouth wide open. Rumblings that Jacob was in for more than he expected at this wedding were abundant, but during this pivotal scene, his world is turned upside-down. This singular event actually changes the lives of all involved, but by the end, we understand the real reason for Jacob's presence at the wedding. It's an amazing feat at times, but Bier avoids falling into the melodramatic trap that often destroys similar fare. There are many opportunities for things to devolve into bargain basement soap opera fluff, but she avoids this and then some. Even those who shy away from subtitled foreign films will find this much more easily accessible and many Hollywood dramas, and, that, in itself, is something special. Image Transfer Review: Given the look of most Danish films, namely those born of the great Lars Von Trier, this 1.85:1 anamorphic widescreen transfer is gorgeous. No longer handicapped by the Dogme95 restrictions, director Bier presents nothing but crystal-clear images, and sharp detail. The numerous close-up shots showcase accurate flesh tones that blend in nicely with an interesting color scheme, well-handled contrast, and a near lack of grain and other blemishes. Audio Transfer Review: The Dolby Digital 5.1 audio is surprisingly lively, broadcasting the wonderful music cues, in an aggressive, loud manner. There's some nice, tight bass, as well, but everything is seamlessly integrated into the overall mix, allowing for crystal clear dialogue throughout. Extras Review: A few extras are here, including A Conversation with Director Susanne Bier. This 22-minute piece is a sit-down chat between Bier and movie critic Morten Piil, during which the director talks about why she no longer makes comedies, and her initial interest in After the Wedding. There's also eight deleted scenes that begin with an introduction by the director. Including the lengthy intro, this supplement clocks in at a whopping 22 minutes, and includes some real juicy footage that would have made things even more interesting in the finished film. 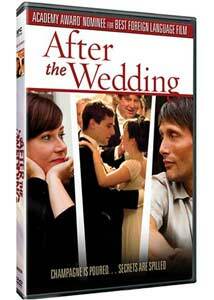 We also get the theatrical trailer for After the Wedding to finish up the extras. A more than worthy Academy Award nominee, Susanne Bier's After the Wedding was worthy of a Best Picture nod, let alone the one it received for Best Foreign Film. Thanks to an engrossing story and an amazing quartet of actors, this is what international cinema is all about. IFC's disc is just as impressive, with wonderful audio and video presentations, and some interesting behind-the-scenes extras.